So, I'm still not famous- but I have been trying a lot of different ways to get people to come to shows. This entry has 2 new marketing ideas I thought of. Still measuring the results. If you're a comedian or a musician and you try either of these ideas, please let me know how they work for you. I am here in Boise, working the Liquid Laughs Comedy Club. I went out for a walk. I usually like to load up my i-Pod with a recording of 1 of my recent sets. I walk until it's done. Then I come back. Usually, I get back to my hotel or the condo with at least 1 or 2 ad-libs- & maybe something I can play on my podcast, The Battery Podcast. Well, on this occasion, I thought: why not walk to the thrift store, too? I could donate 1 of my CDs. The first comedy album I ever listened to was George Carlin's "A Place For My Stuff." I got it at a thrift store. I became an instant fan. I must have played that album 42 times! I also shared it with a ton of my friends. So, why not let somebody find my CD, "JAke's First Purge?" They could buy it for a buck or 2 & if they like it, maybe they'll play it for a friend? So, I walked my Jake's First Purge CD to the thrift store. 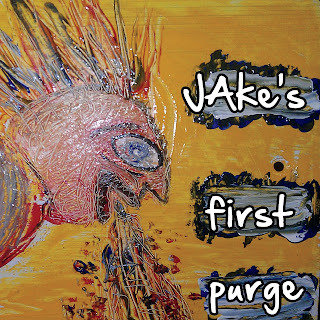 I donated my Jake's First Purge CD. While I was there, I thought: why not tell the ladies there about the show? I told them about it & they said they had just heard me on the radio. Cool! I gave them a card. I told them if they want to see the show, to come on down & use my name. It's possible nobody will ever buy that CD. It's probable that those ladies won't come down. However, with minimal effort, I shared my comedy CD & invited some guests. Now, to really do this right next time, I'll get the ladies' names & find out which night they can come. Then I'll call in the comps myself. The easier I make it for these ladies to see the show, the more likely they'll come. Well, if you try either of these tips, let me know how they work for you.